We understand that student's need money. There is nothing worse than not money in your pocket. 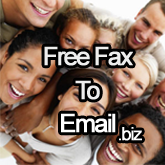 Receiving faxes is not something that we need very often, but email is a standard today. A student does not have the money to spend on receiving faxes, so why spend money at all when an email is free?